Milk jugs are the perfect size and shape for organizing things. Even the handle is perfect! 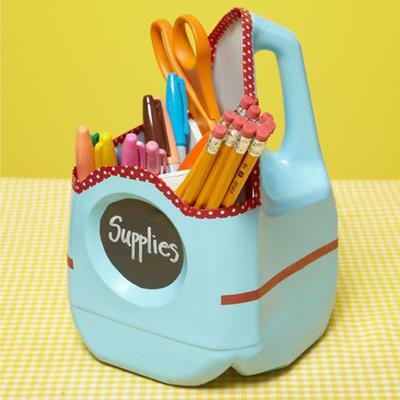 You can simply cut off part of the top, paint the jug, line the edges with fabric, and then you have a perfect organizer for arts & crafts supplies! You can fill it with scissors, markers, pencils, anything! Thanks for the idea, Amy Bell! Is it possible to read in spanish that? Very creative new recycle ideas. Thank you for sharing this. SI like the idea milk jug for grocery bags. I will try this out. Thank you for the tip.